Bill Keyes The Widening Gyre presents a glimpse at the Industrial Age as it truly was, envisioned by those far-sighted luminaries and Savants who looked beyond the feeble limitations of man and created a world in which science, technology, and logic triumphed over the mundane physical limitations of the Universe. And yet, Logic's victory is far from complete. This is also a dark and gothic world, where monsters from ages long past still prowl and men with evil motives call upon ancient sorceries to grant them the power to control the world. 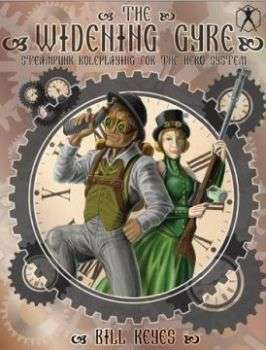 The Widening Gyre is a world in which you'll play consulting detectives and adventuring academics, occultist thrill-seekers and Savants both heroic and insane, all working for a secretive organization of benevolent technologists who seek to prevent the dark monsters of humanity's past from overwhelming its bright and burgeoning future. Welcome to the Widening Gyre! The Widening Gyre is a setting for Star Hero 6th Edition, a genre book for the HERO System 6th Edition. The zip file includes the PDF, a cover image, and a t-shirt image.